Your Donation Can Save a Life TODAY! Meet Simba, a golden boy with a gentle spirit who came so broken and has come so far. It’s hard to imagine a human abandoning a dog because of a hearing impairment. He loves to play with other dogs, toys etc., just like any other dog and needs no special accommodation, just the patience and kindness of a willing heart! He’s house & crate trained. Without a doubt he’ll make an awesome lifelong companion for the right person or family. Meet Lady, this little golden/lab mix gal weighs no more than 20 lbs and as fast as lighting! There’s nothing shy about this little she bold, clever and runs circles around other dogs, she loves to play with big/little dogs/cat etc., don’t let her small size fool you, she a little dog with a big (sweet) attitude! She’s loves squeaky toys, bouncing balls etc., taking long walks and she’s house/crate trained and is so ready for her forever home! Meet Natalie, one of the sweetest golden gals you’ve ever met, she beautiful on the inside and the outside! she loves everyone she meets, love playing with toys, other dogs, going for long walks and just chillin’. Don’t be fooled by her age, she got a lot of energy and is absolutely perfect for someone looking for a golden to love cause she got a lot of love to give in return. Moose’s sweet, giant lab, so thankful, happy and full of life, he loves other dogs and hanging out, watching TV, going for walks, and going everywhere you go would be his greatest joy, he’s house and crate trained. Bailey, what can’t we say about Bailey. He’s just the the world’s best dog! He’s young, sweet, gentle, loving, a cuddle bug,perfect energy level, excellent dog on a leash, house and crate trained, just the most amazing and wonderful dog ever! He came to us very timid and afraid, and he’s a little shy when he meets people, but boy after that he’ll win your heart! 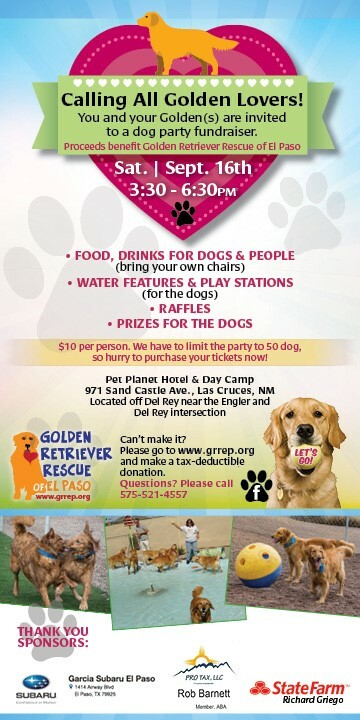 Support Golden Retriever Rescue of El Paso Simply by walking your dog. Every time you walk, WoofTrax donates to us. Download the Free App in the App Store or Google Play and Take Your Walk for a Dog every day.